An iron and bone handled knife with gold inlays. This piece was part of the gold inlayed pyxis seen here. The knife is in a great state of preservation and the bone handle has remained fully intact. The blade has corroded as it is iron, however it still retains its shape which is remarkable for its age. The handle has three iron posts holding it in place on both sides while a third bronze decoration near the back in the shape of a column has a fine hole drilled through it. This was likely used to house a strap of some type to either hang it of allow it to be held around the wrist while in use. 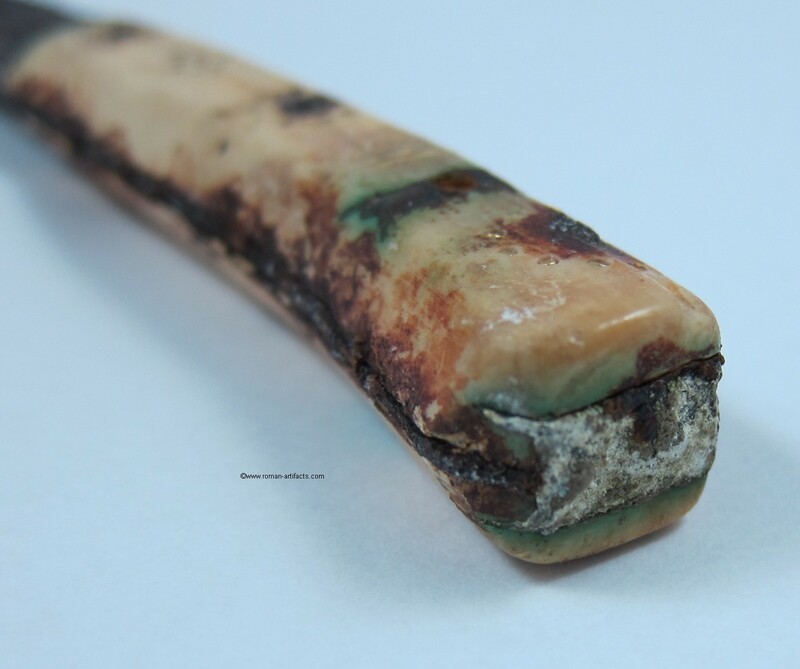 The rear portion of the knife appears to be lead filled in between the bone handle and actually holds both the handles sides together. This may have assisted in keeping the bone parts together while also acting as a counter weight for the balance of the knife. The decoration on the hilt of the knife is elaborate and matches neatly the pyxis in its style. Each of the iron posts is surrounded by a ring of golden circles which have been inlaid in to bone in the form of cut gold wire studs. Three golden lines which are inlaid in to the hilt add to the decoration elements of the blade. The knife overall is part of an important set of pieces and was clearly part of a Roman elite persons personal items. The craftsman who made the pieces was talented and shows the great level of skill involved. A testament to the civilization that Rome was for hundreds of years.